The Diversity Immigrant Visa Program, better known as the green card lottery, makes up to 50,000 immigrant visas available each year to randomly selected individuals who are from countries with low rates of immigration to the United States. immigrant visa in the future. If you ever want to visit the United States as a visitor or with a non-immigrant visa, entering the green card lottery could make that more difficult. When you apply for a U.S. non-immigrant visa, you generally must prove your non-immigrant intent. That is, you intend to return to your home country. By entering the green card lottery, you are signaling your desire to immigrate to the United States. If you later decide that you would like to visit the U.S. and apply for a travel or student visa, you must disclose your participation in the green card lottery. The results of the lottery don’t matter. The problem that arises is that you have expressed interest in immigrating to the U.S. This will likely be taken into account by a consular officer when making a determination on a non-immigrant visa. Participation in the lottery won’t automatically bar you issuance of a non-immigrant visa, but your application will be scrutinized more closely. You are from an ineligible country. Again, the green card lottery is in place to help individuals from countries with low rates of immigration to the United States. Therefore countries with many immigrants to the U.S. generally are not eligible. The eligible countries for the green card lottery may change each year. It’s based on which nations and which areas of the world) sent the fewest numbers of immigrants to the U.S. in proportion to the size of their populations over the previous five years. You are currently in the United States without status. The green card lottery is not an amnesty program, and therefore you should not expect it to be a remedy for past immigration violations. A person who is in the U.S. without legal status that wins the green card lottery will not be permitted to apply for their residence from within the U.S. (“adjust status”) unless they had some other legal permanent residence visa petition (family- or employment-based) filed before April 30, 2001. If you return to your home country to attempt to complete the process, you will almost certainly not be allowed to return to the U.S. 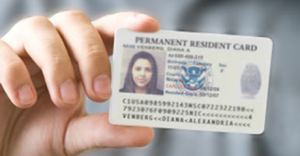 Depending on your time spent in the U.S. without legal status, you will be prohibited from returning for 3-10 years. If you find yourself in one of these situations, use caution and contact an experienced immigration attorney. There are numerous websites set up to deceive innocent people into believing that they official U.S. government sites or can facilitate the green card lottery process. Some scams even contact you by e-mail with bogus claims. There are some companies that prey on entrants by asking them to make a payment for the application. However, the only official way to enter for the U.S. green card lottery is to apply online at the Department of State website and there is no fee to apply. CitizenPath provides simple, affordable, step-by-step guidance through USCIS immigration applications. Individuals, attorneys and non-profits use the service on desktop or mobile device to prepare immigration forms accurately, avoiding costly delays. CitizenPath allows users to try the service for free and provides a 100% money-back guarantee that USCIS will accept the application or petition. We provide support for the Adjustment of Status Application (Form I-485), Petition to Help a Relative Obtain a Green Card (Form I-130), and several other USCIS forms.